What Can We Learn From Grizzly Bears? October 31, 2012 in Animal Stories and Principles, What Can We Learn From... ? 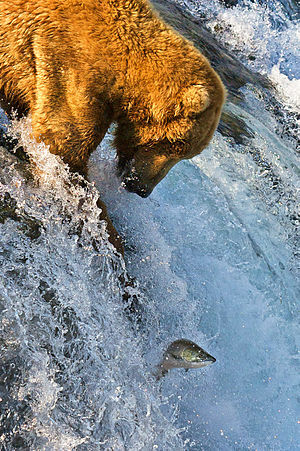 One of the most iconic images from nature is the sight of a grizzly bear in the middle of a river catching salmon with nothing but its paws and teeth. Grizzlies need to put on weight quickly for their hibernation and fortunately, this period of weight gain comes during the migration season for salmon, who travel upstream to spawn before dying. You’ve got to get into the river – Grizzlies don’t stand on the banks afraid to get their paws wet. They march right into the water where the action is. Life’s like that for us too. We can’t be successful if we’re too afraid to get wet. We have to go where the opportunities are because they won’t just jump into your lap. You’ve got to be alert – When they get into the water, these magnificent bears are fully alert, constantly looking for opportunities to find their next meal and valuable protein fix. They know that there’s time to hibernate later, this is the time to be fully focused on the moment. The same is true for us too. If you’re aware enough, there are opportunities everywhere. Opportunities to grow your business, to improve your relationships, to extend your network, to increase your level of influence and to partner with what God is already doing around you. Don’t worry about the one you missed – One thing that I’ve noticed is that grizzlies don’t catch every fish they ambush, but when they miss one, they just let it go and focus on catching the next salmon. It’s a reminder that not everything that we try will work. People will say no to your ideas, you won’t get every job that you apply for and sometimes you’ll just stuff things up. Don’t look back at the one that got away, look ahead to the next opportunity. I’m fascinated by grizzly bears and would love to see them hunting in their natural habitat, but in the mean time I’ll just have to learn from them. Are there any other principles that we can learn from these remarkable creatures? Loved this Coach D! Another principle? hhmmm. What about how protective the mother’s are of their cubs? Not sure how you can turn that into something more, but there you go! Thanks Debbie, protecting the next generation is a great principle too.